Those 3 controversial letters have caused great angst for many. The NBN, first conceived by the Labor party before the 2007 election was a dream to bring a high speed fibre optic network to all businesses and homes - the benefits being faster internet speeds would make us as a country stand out or at least stand with other first world internet speeds. There is no denying that it is great news that more Australians will have access to faster broadband, however you cannot just lay fibre to the node (FTTN) "fast" and expect it to work. Prime Minister Turnbull once lauded this NBN project as "realistic" but now I think it is pretty clear that this was inaccurate in regards to cost and projected length of rollout time. The NBN corporates themselves have admitted that they didn't quite know what they had purchased, with their limited experience of the copper and that "the quality of this network is not fully known as there has been limited opportunity to evaluate the physical infrastructure at significant scale". Indeed the promise of the NBN has always been a starry eyed one. Labour envisaged fibre for nearly all Australians with up to 100 Mbps guaranteed. Liberal promised 25 Mbps "for all Australians" by 2016... neither so far has been met. Labor envisaged a NBN with FTTP (Fibre to the Premises) which would initially be more costly to set up however Australia would be in the forefront of fibre optic internet speed connections. However when Liberal came into power as few years back this idea was abandoned for FTTN (Fibre to the Node). 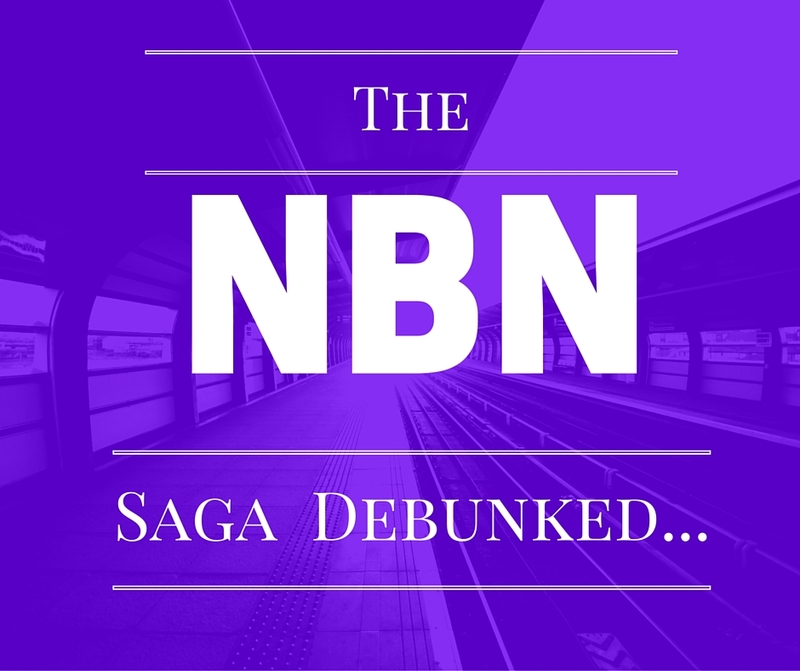 Whilst everyone is happy for faster internet speeds from what they previously were - there are many issues with the NBN that keep being swept under the rug. In fact, FTTN is really a short term "stop gap" using old technology. It has been rolled out to many areas of the world over 5 years ago. In fact, Telstra proposed the use of this technology in 2005, however their pricing and competition model was rejected. Most countries that have installed the FTTN like Germany, New Zealand and the UK are now replacing it with FTTP. Unfortunately FTTN isn't really a pathway to later upgrades to FTTP - making this a complete waste of money. Add to that the fact that it delivers different performance levels depending on your location and the up-load speeds can be troublesome - it is no wonder we all grunt and sigh when we hear to words NBN. Whilst we here in the office (like all IT nerds!) are excited for the NBN, the fact that it is a short sighted solution that continues to leave Australia paddling behind the rest of the developed world, and the amount of money spent and that will have to be spent again if we are to ever have better solution is not to be forgotten by the fact we can download Game of Thrones and Walking Dead much faster than we used to!